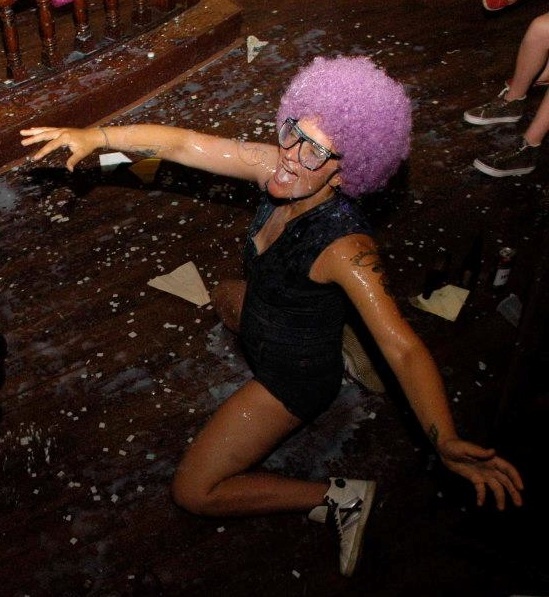 Tree, one of the organizers in a purple afro being sprayed by Cherry Bombs milky performance! Founded in 2012, Rhinestone Steel strives to support and expand Pittsburgh’s queer music and arts scene. We organize an annual music festival as well as host events throughout the year- like homo aerobics. In an environment where queer voices are seldom heard in mainstream music and arts spaces, Rhinestone Steel is more than just a music festival; it is a celebratory political action creating visibility and space for queer expression. We work towards creating a more inclusive, queer, artistic space that people can participate, feel accepted and become motivated! Rhinestone Steel cares! Rhinestone Steel is what happens when you mix queers, music, art, politics, compassion, dance and inspiration! We want the word to spread like wildfire that Pittsburgh is a place for queers from everywhere to come and perform! Over the years we have showcased a wide variety of music and arts from queer people with very diverse backgrounds, including performance artists, poets, musicians, dancers, and puppeteers. We wants to exhibit queer art by encouraging local artists to collaborate to turn the venue into an art installation. Our hope is that the Pittsburgh queer scene will grow together by seeing and celebrating eachother’s talents. Pittsburgh is a city of bridges and we are trying to build more. Beautiful bridges between local and national queer organizations and between people who live in Pittsburgh to inspire a creative, loving and closer community. The Second Annual Rhinestone Steel Music Festival was awarded the Sprout Seed Award. Thank you Sprout Fund! Hi Rhinestone folk! My name is Be Steadwell, I’m a singer songwriter from DC and I’m coming to your festival this weekend! I’m super excited! I also planned a small concert of my own for Sunday afternoon. I’m looking for a p.a. or amp to borrow that day. If you know of any musicians in the area who might be down to loan some items, let me know! Thank you! Hi Be Steadwell!! My name is etta and i saw you at Toshi’s festival last year. i can probably find you a pa or amp to borrow. 443-603-6964. i will contact somone know. please text me and ill connect you. where are you performing? ?